Just because the Cleveland Browns are (thankfully) on their bye week doesn’t mean everyone gets to take a seven-day breather. Sure, enduring 12 miserable weeks of football should be enough to earn everyone involved a nice vacation. Still, there’s work to be done during this time off, specifically for Cleveland’s front office. Getting a week without having to work on a game-plan means the Browns’ higher-ups have free time to put some focus on contract extensions for potential free agents on the roster. While this is usually something saved for the offseason, an argument can be made that Cleveland needs to prioritize this now. Of course, the team doesn’t need to lock up everyone who’s on an expiring contract. However, there are two key players the Browns need to extend as soon as they can – wideout Terrelle Pryor and linebacker Jamie Collins. If the team was smart (please hold the laughter), it would make re-signing these two the top priority of the bye week. Many seem to be upset about the Browns having a bye this late into the year, and with good reason. As mentioned this past weekend, a week off with four games left in this brutal season could be tough for players to recover from. After taking 12 weeks of damage, you’re forced to wonder if a breather in early December will do much to help the cause. That said, the advantage of having a bye week this late is it gave the Browns plenty of time to evaluate guys like Pryor and Collins. As a result, the team can feel comfortable making a push now to try and get a deal in place for each. Collins hasn’t been in Cleveland all year, sure. At the same time, he’s proven to be a game-changer on defense and easily has more talent than the majority of the guys he takes the field with. There aren’t many Pro Bowlers on the Browns’ roster, and seeing as Collins is one of them, you can’t afford to let him go. 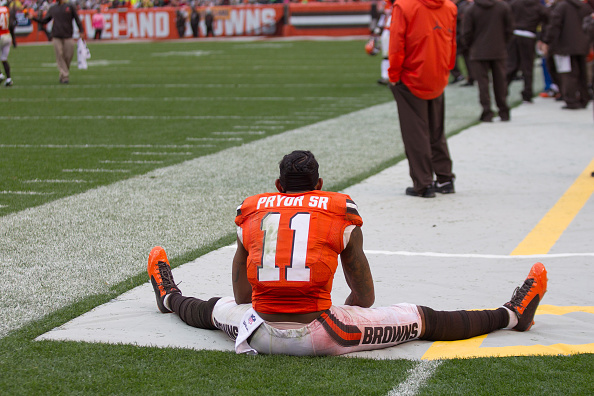 As for Pryor, you simply can’t say enough about the career change he’s made and the impact it’s had in Cleveland. Switching from quarterback to receiver is a Herculean task on its own, so the fact Pryor has not only succeeded in doing so, but has also become the team’s No. 1 wideout is incredible. The concept of him playing on any other roster next year would be an absolute failure by Cleveland’s front office. So, with some time off from football, it behooves the Browns to make some progress on extensions for each of these players. For what it’s worth, it might be easier to take care of Pryor than it would be for Collins at the moment. The receiver has gone on record as saying he wants to stay with the Browns, as he loves playing for coach Hue Jackson despite the fact he’s yet to experience a win under him. This is obviously something the team needs to take advantage of. Collins may be a tougher sell, as he was jettisoned from the Super Bowl contending New England Patriots to the winless Browns. Convincing him to stick around beyond this season will understandably take a lot of effort. That said, he needs to be retained simply because the Browns gave up a draft pick to get him. Sure, it wasn’t a first-rounder. At the same time, that a Cleveland team going nowhere this year parted with something valuable to bring him on implies he wasn’t a rental. As a result, letting him walk this winter would be a waste. Additionally, letting too much time go by before opening negotiations with either player carries plenty of risk. The Browns have the advantage now of being the only team able to negotiate with Pryor and Collins. Once this situation changes come season’s end, and teams which actually won games in 2016 are allowed to talk to either player, Cleveland suddenly loses a ton of leverage. It goes without saying this is a situation the team can ill-afford to run into. With plenty of evidence proving both Pryor and Collins need to be re-signed, along with a conveniently timed bye, the team would be foolish to let the opportunity to work on these extensions pass it by. Here’s hoping Cleveland realizes this and is already on the phone with both players’ agents.